This is a beautiful walk that starts with a short 600m walk to the lookout – a little stretch to warm up your walking legs. Next comes the challenging 8.9km circuit walk, which takes in the view of The Narrows Gorge, famous for its imposing red quartzite cliffs and vegetated gullies. The must see Terraces (a short 500m diversion) is a spectacular series of platforms created by the flow of the creek, a great example of erosion, rock layers and ancient creek bed ripples. It’s truely a Geologists paradise! To top it off the gorge valley floor is richly vegetated with southern Cyprus pines and River Red gums. 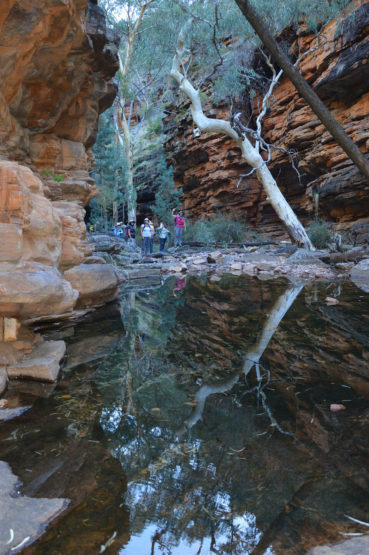 Named by Mr Matthew Flinders himself, who was a seafarer with an active visual imagination, Dutchmans Stern is definitely a must-do walk in the Flinders Ranges. The 10.5km circuit takes you through gorgeous woodlands full of Sheoak and Sugar Gums. The understory of these woodland areas is full of daisies, curry bush and other shrubs that are shade tolerant. While a steep climb, once you get to the peak, you are rewarded with stunning views from the “stern”. Fields, rolling hills and ridges stretch out as far as the eye can see. If you look closely, you might even be able to spot some 700 million year old dolomite rocks of the Burra Group (rock formations). A great way to start this walk is from the Black Gap carpark in Bunbinyunna Creek. 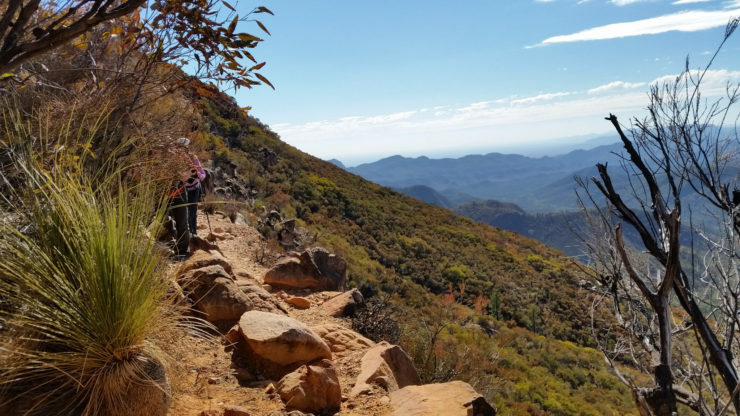 The walk offers great views from the southern perimeter of Wilpena Pound. The amount of flora found within the pound surprises most people and is one of the main reasons early settlers thought it would be a good place for agriculture and pastoralism. Wilpena Pound is surrounded by mountains that form a natural amphitheatre. The mountain walls act as a topographic barrier and the pound receives more precipitation and less evaporation than the surrounding land. This forms a variety of micro-climates, rocky outcrops, flat woodlands and plenty of wildlife. Looking into the pound as you walk down from the Bridal Gap is spectacular. The Hill Family homestead is a great place to have a rest and take in the history of the area. Rawnsley Bluff was named after H.C. Rawnsley who was discharged as a surveyor by the Govenor of South Australia in 1850. After just 3 months on the job as he was found to be incompetent, having presented himself as a surveyor under false pretences. It is a challenging climb to the summit, but not without rewards. The stunning views across the Chace Range towards the South East and the Elder Range to the South West of Rawnsely station are truely breathtaking. There are many beautiful shrubs and wildflowers at the base of the bluff sheltered from the westerly winds. At the peak, there is a cairn lookout that is a great stop for lunch. This trail also has a diversion of 600m to a lookout across Wilpena Pound. Tanderra Saddle is a shorter section of the St Mary Peak hike but not any less rewarding. The hike begins on the outer edges of Wilpena Pound through Sheoaks and Grass Trees. As you walk up to the top of Wilpena Pound, the scale of just how big of an area the Flinders Ranges are becomes apparent. The ridgelines highlight the massive tectonic pressures that have formed the area. The everlastings, rock formations and the views make this walk a highlight of the Wilpena area. From the top of the Saddle you can look into the pound as well as spot the Heysen and ABC ranges to the north. St Mary’s Peak is important to the Adnyamathanha creation story and the Adnyamathana people have asked that visitors not climb to the top of the peak. Many people who have been in this area, including myself, consider the Aroona Valley to be the most beautiful place in the Flinders Ranges. Aroona is an Aboriginal word meaning running water or place of frogs. Follow the undulating trail through the Aroona Valley between the ABC and Heysen Ranges towards Parachilna Gorge. The valley is full of Northern Cypress Pine, River Red Gums along the creek and the Aroona Springs can be found West of the Aroona Station’s pastoral cottage. 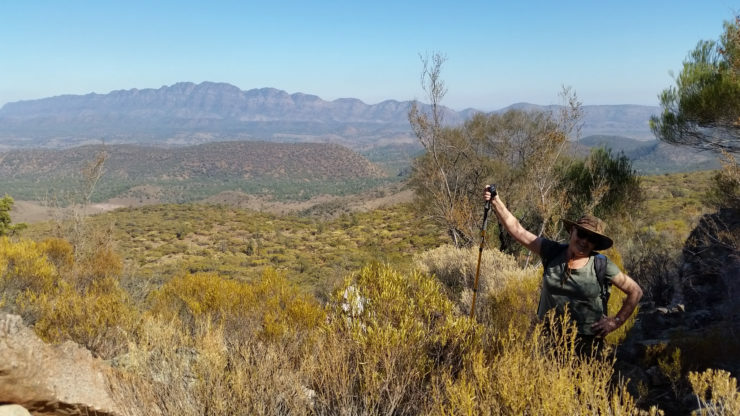 Admiring the art of Hans Heysen, a German painter, is a great way to learn about the history of the area and to finish your Flinders Ranges adventure.